or, Two Different Messages with Two Critical Functions That Are Easily Confused. There are two different web pages with two corresponding email messages for your brand-new subscribers that have similar, but different, functions — and rookie list publishers confuse them all the time. Let’s make sure you’re clear on them. When someone decides that they want to subscribe to your list, they’ll probably do it on your web site, and most likely they’ll use a form generated on your site by your Email Service Provider (or ESP) to do it. When they click the submission button on the form, things happen — and you need to direct exactly what happens. Pretty straightforward! But then it gets all confusing. Some people call one of the two pages you want on your site the “confirmation page” …and others call the other of the two pages the “confirmation page”! No wonder people get so confused! So let’s straighten it out. Once the new reader fills out that form on your site, you almost certainly have control over the next page that person sees. It’s important real estate, so don’t waste it! I use it to tell my new subscriber what the next step is: I always, Always, ALWAYS have them confirm their subscription. Some ESPs don’t require a confirmation step, but for an open list (as opposed to a list of those who have actually bought things from you), I think that’s a big mistake. I’ve had obliviots use the subscription form to harass others, putting in someone else’s address to bother them. Imagine adding someone like that to your list: they didn’t ask to be there, they may not have ever heard of you, and now you’re sending them business email. The difference between that and spam is …what? That’s right: not a thing. Confirmation avoids that. So, once they submit their subscription, I use the next page they see to immediately tell my new subscriber what the next step is: confirmation. 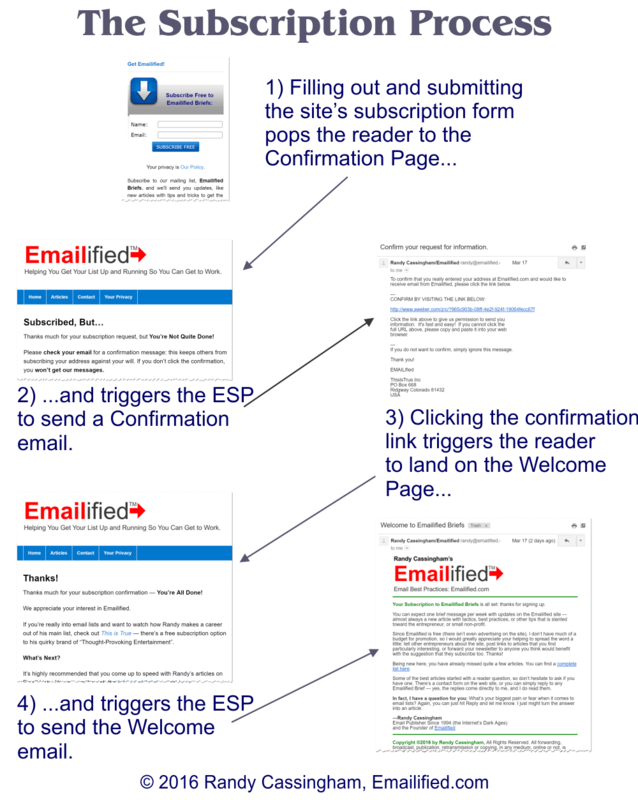 Separately, your ESP will send them a “confirmation message” — an email — asking them to click a link to confirm they really want to get mail from you, so the purpose of the “Must Confirm Page” is to let them know to expect it. It’s for their benefit as well as yours: anyone can put anyone’s address in a form, but only someone with access to that address’s inbox can open a message there and click a link. If they don’t, they won’t actually get added to your list. I don’t tend to use this page to try to sell the reader on anything: I don’t want to send mixed messages, or distract the reader from the Most Desired Action: to get them on my list so I can speak to them later. They’re willing to do that because they expect information that’s useful to them; that’s a win-win. So that’s the first “confirmation page” and its corresponding email message. Your ESP should also allow you to specify the page your new reader ends up on after they’ve clicked the confirmation link in that first automated message. This is even more important real estate: this is the first thing your new reader — your new customer — will see once they complete the subscription process. Shouldn’t you welcome them to your list? My preferred terminology for the first step is the “Confirmation Page” (with its corresponding “Confirmation Email” sent by the ESP as part of the process), and the second is the “Welcome Page” — where they land once they’ve confirmed they want to be put on the list. It has a corresponding “Welcome Email”. Different ESPs may call them different things; it’s the functions that are important to have clear in your mind. The confirmation also triggers the ESP to send a Welcome message by email: you need to have that written and installed when you start recruiting subscribers so that it goes to them when they subscribe. That’s also a place where you can suggest a Next Step. The flow: click to see larger. If you’re still not clear, look at the two pages — and their corresponding emails — by their functions; you can click the diagram to see it full size. 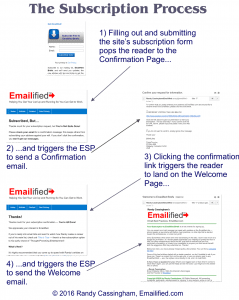 The first page, which the reader lands on automatically after filling out and submitting the subscription form, advises the new reader that they have to confirm their subscription before it becomes active, and directs them to check their inbox to look for the corresponding email that has the confirmation link in it. If they don’t find the mail and click the link, they’ll never really be subscribed, and will never get to the second page. Because of the function of this page and email, I call it the “Confirmation Page”. It’s so important to get them on your list that I suggest not using it for any other function: don’t use this page to try to sell anything. The second page, which the reader lands on automatically after clicking the confirmation link that was emailed to them, lets the reader know they successfully confirmed and are now on your list. It’s appropriate to thank them for their subscription, and to welcome them to your list. And it is appropriate to suggest a next step, such as reading an article, or buying something. I call this page the “Welcome Page” and, in the background, also triggered by their confirmation click, is a Welcome email which you need to create at the ESP, so that it is sent to them as soon as they confirm. 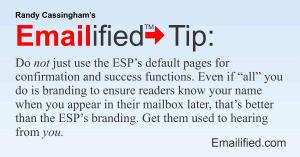 Do not just use the ESP’s default pages for these important functions — especially the second one. Even if “all” you do is branding to ensure readers know your name when you appear in their mailbox later, that’s better than the ESP’s branding. Get your new readers used to hearing from you. That means creating the pages on your site, and setting up your list to direct your readers to those pages: the Confirmation Page when they submit a subscription request, and the Welcome Page when they click the confirmation link. And, very importantly, what if your Email Service Provider doesn’t allow you to use your own pages for these two functions? Easy: switch to one that does — it’s that important. I use AWeber, and they certainly do allow custom pages for these important functions. More on why I like AWeber is here. Randy is one of the first email publishers ever, starting in 1994. By being one of the first, he helped establish the "Best Practices" for email publishing and the features that Email Service Providers now offer to their customers. Randy and his work have been featured by CNN, Fox News, the New York Times, Newsweek, the Los Angeles Times, WIRED, Information Week, Entrepreneur, and countless other media outlets. He lives in rural western Colorado ...because he can. New here? This is a discontinued project of Randy Cassingham from This is True — the oldest entertainment newsletter on the Internet (since 1994). While he is not adding more articles to this site, Randy is leaving this site online for now as a resource to other email publishers. Start here: Emailified’s First Article. Copyright © 2015-2016, This is True Inc., All Rights Reserved. Emailified is a trademark of This is True Inc.